Homer Martin III brings in tin type of grandfather Home Martin Sr.
Martin was going through his personal effects to see what he has and to decide what to do with them. 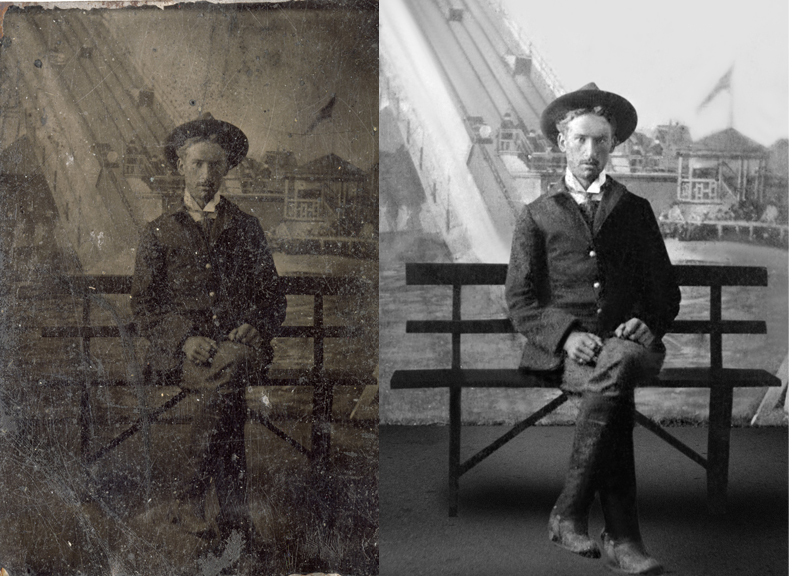 He made a wonderful discovery, a tintype of his grandfather, Homer, who served in as a volunteer for the 20th Kansas regiment during the Spanish-American War. He said that he had served in the Philippines 1898-1899. Martin was named after his grandfather and is actually Homer Martin III. We’ve done lots of Legacy type work for him in the past and knew that Leave A Legacy was just the place to bring it to. We scanned it in, restored it and printed copies for his two cousins, his twin sister and his two kids.